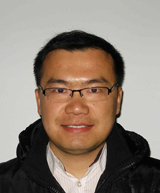 Guoqiang Li successfully completed his PhD trial lecture and thesis defense at the Norwegian University of Science and Technology on Thursday, the 27th of October 2016 and will be awarded the degree of Doctor of Philosophy. The title of his thesis is “Innovative methods for large-scale fingerprint identification systems” and the given topic for his trial lecture was “Privacy Threats Emanating from Personal Drones”. Second external opponent: Junior Assistant Professor Dr. Matteo Ferrara, Universita di Bologna. Administrator for the assessment committee: Professor Stephen Wolthusen, Faculty of Computer Science and Media Technology, NTNU in Gjøvik. Professor Stephen Wolthusen led disputation. Guoqiang Li carried out his PhD work at the Faculty of Computer Science and Media Technology, NTNU. His supervisor was Professor Christoph Busch, Faculty of Computer Science and Media Technology, NTNU in Gjøvik and Co-supervisors were Associate Professor Bian Yang, Faculty of Computer Science and Media Technology, NTNU in Gjøvik and Professor Patrick Bours, Faculty of Computer Science and Media Technology, NTNU in Gjøvik.